Before I talk about pens & ink, I want to talk about the other tools I use. A lot of these are very modern, and you know what? I don't care! ... Okay, I do care... but I'm making a deliberate choice to use modern shortcuts so I can focus on the calligraphy itself. While I want to learn and experiment with the period way of doing everything, I can't afford to take the time to do things the medieval way for every project and still get them done when they are due. I use small pieces of MDF. You can usually go buy a full sheet and have your home improvement store cut it into several boards in a few different sizes for you. 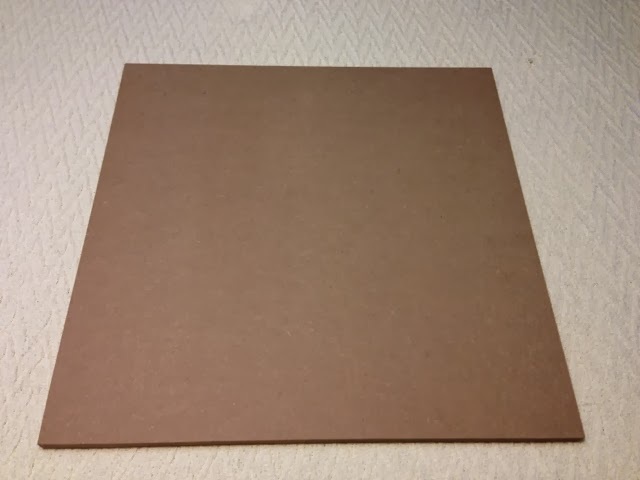 The smooth, square edges of this board are perfect for using with a T-Square. MDF is not a fan of moisture, so careful bringing it to events if you don't finish it. If you do finish it, make sure the finish won't transfer to your paper. I need something to hold the paper to the board. But I don't want it tearing off the surface of the paper when I try to remove it... 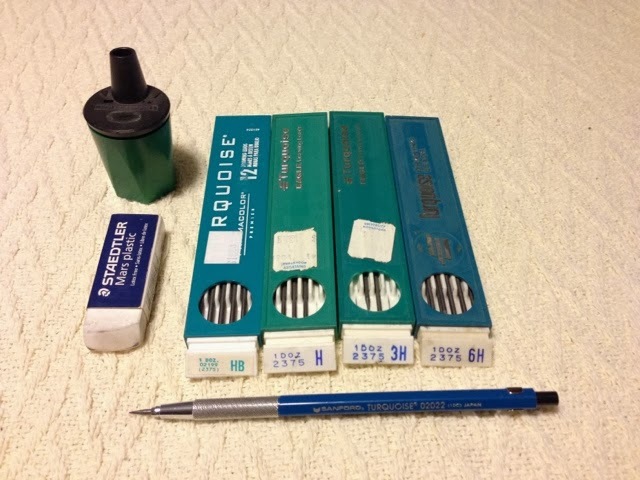 I have a box of drafting dots, but I find they are a bit too sticky for softer paper unless I work some of the glue off first with my fingers. The T-Square allows me to get perfect, reproducible vertical & horizontal lines. Triangles can be used with the T-Square to quickly draw lines at measured intervals. Cork-backed metal rulers are used cutting large pages down, and as a guide when inking straight lines. This little tool is the biggest time saver I have ever used... By spinning the disk, I adjust the vertical height between the holes. 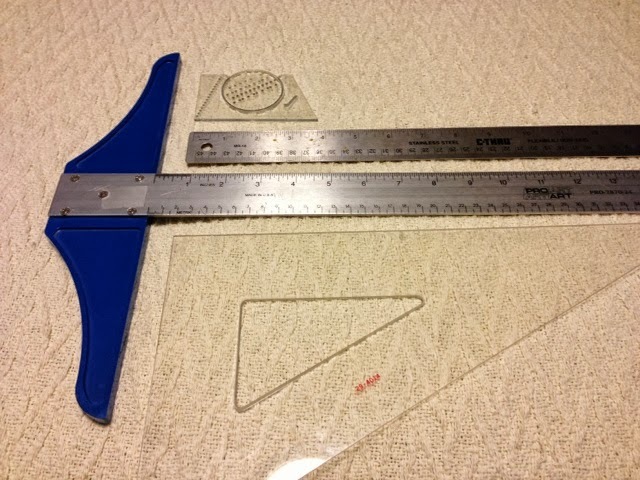 I hold my T-Square across the paper, place the tip of my pencil in the topmost hole of the scale I want to use, and slide the guide across the paper. Then drop the pencil to the next hold down, and slide back the other direction. Repeat until you reach the bottom hole. Slide the T-Square down the page until the top hole is lined up with the bottom line, and continue. It insures that my guidelines are evenly spaced, and allows my to adjust their height very easily to match the script I'm using. My favorite kind of pencil for lining my pages is a drafting pencil. Drafting pencils use a 2mm diameter lead that comes in any hardness you like. HB lead is the equivalent to a standard #2 pencil, and they get harder with H, 2H, 3H etc. 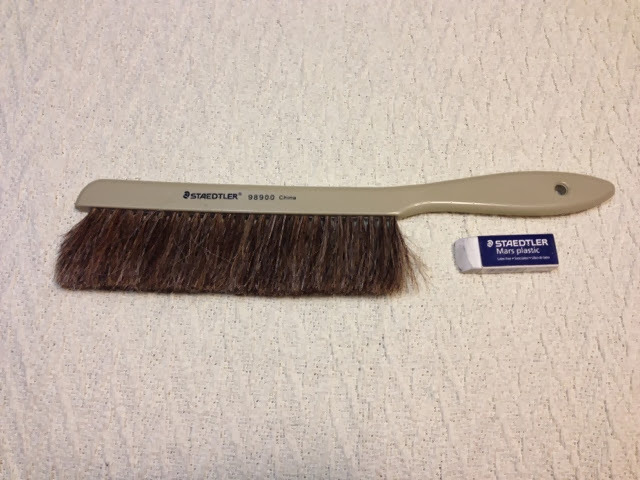 Because of the large diameter of the lead, it is also possible to sharpen it to a very fine point. I prefer to use the hardest lead I can get away with, as it holds this fine point longer. Finer points leave thinner lines. The smaller my calligraphy, the more important it is for me to have fine guidelines, improving the consistency of my letter height. The problem with using a harder lead is that it can dent or score the paper, leaving a permanent line behind even after erasing. For softer paper like Bristol Board, H or 2H is about as hard as I can go, and I have to be very careful about how hard I press. The sharpener pictured is a portable model. I also have one that as a built in clamp holding it to my desk which I find a little bit easier to use. Once done with the the calligraphy, I need to erase my pencil guidelines. A white mars eraser does a great job without being too harsh. When done I use a brush to clean off the page. Blowing on the page risks spit landing on the page, ruining the calligraphy. Wiping the paper with a bare hand risks oils contaminating the paper and causing problems with any ink or paint being applied later. I plan on talking about this more when I get around to posting lessons on technique, but I find it very important for my own consistency to work at a very steep angle. 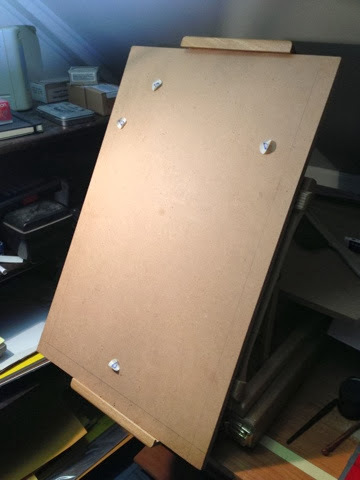 I use an easel box I found at Michael's, with a piece of MDF camped into the easel. The bottom sits just below the edge of the table or desk, so that as I push against the surface it cannot slide away from me. By working at such a steep angle, I prevent neck and back cramps, I improve the consistency of my downstrokes by letting my arm hang, and I can get closer to the work to see what I'm doing. If you've never tried working at an angle, try it, the difference may surprise you. Good lighting. It's helping to be able to see what you are working on! Cheap paper. Regular printer paper is great as a "tool" in that you can use it as a shield between the piece you are working on and your hand. You can also get some thin cotton gloves and cut the tips off the thumb, index and middle fingers. I also keep some cheap paper under my inkwell to use when testing ink flow after dipping, or to get ink flowing again if I've let the ink start to dry in the nib. 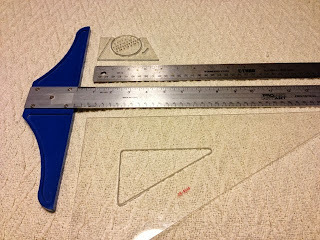 A compass, curves or other drawing/drafting templates also useful to have around. Even if you don't plan on sketching for illumination, they can be helpful for planning cadels & flourishes. There are also period examples of calligraphy written on curves. Some calligraphers prefer to use a light table and a separate page or transparency with lines printed on them taped behind the paper. I don't have a light table big enough to try this with, and it might be difficult to prop one up at the angle I prefer. Light tables are also very useful for transferring sketches before painting, or using the sketch as a guide when drawing in margin lines.